In 2013, Brad helped bring the Wills for Heroes program to Central Oregon for the first time. Through this program, attorneys volunteer their time and expertise to help first responders and veterans draft wills and other estate planning documents. 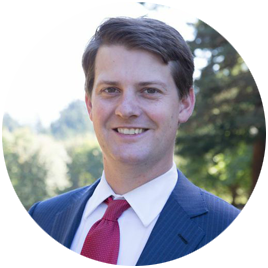 Brad is also on the Clackamas County Family Law Advisory Committee and active in the Multnomah County Children’s Representation Project. Brad was selected by his peers for five consecutive years for inclusion in Super Lawyers Rising Star editions from 2009-2013. In November 2012, Brad was honored by the Daily Journal of Commerce with the “Up and Coming Lawyer of 2012” award. In addition to tennis, Brad is an avid sportsman who enjoys golf and fly-fishing. His formative years were spent dry-fly fishing the Deschutes River, and he tries to return as often as possible. Brad and his family enjoy traveling, wine and testing the limits of their expertise in the kitchen. “I couldn’t recommend Brad more. He is kind, thoughtful, and insightful. It was such a relief to have him by my side. The knowledge that if the mediation became too confrontational or threatening I could turn everything over to Brad, allowed me to not feel trapped or cornered. I am sure this peace of mind enabled my ex-spouse and I to finish things in a cordial manner. I feel that Brad has a strong ethical code, and for that I was very thankful.” — C.
“Brad Miller and Deanna Rusch were top notch in helping me through a less than ideal situation. They were constantly available providing personal thoughtful guidance and even just a friendly shoulder to lean and cry on. They will work hard to turn a difficult decision and process into the best possible situation. I recommend Brad Miller and the entire council available at Stahancyk, Kent, and Hook. Call Brad for anything and everything because he will work his tail off to get it done and get it done right the first time!” — D.
“The law firm of SK&H holds true to their reputation of excellence. I worked with the team Brad and Jennifer in my recent divorce and felt completely and thoroughly well represented by them. They were efficient and well directed to complete things as they needed to be done. They were patient with me regarding the challenges of my circumstance. In the end, having them represent me made all the difference in the outcome of my settlement. I am so grateful for them and the job they did for me.” — L.N. “Thank you for referring me to Brad. He was fantastic. At first, I was a little concerned because he is so young but he did a great job. He was professional, really funny and held his own. I think he earned his keep.”— J. “Brad helped me through a difficult transition. It was much more than lawyering, but the lawyering was top notch.” – S.
“I received 3 references to Stahancyk, Kent & Hook when I was considering divorce. I was in an emotional and financial crisis, but Brad Miller listened to my story, gave me a box of Kleenex and validated my fears and concerns. While Brad was sensitive to my emotions, he was strong, thorough, and extremely competent. I am grateful for the way you and your office handled my case.” – M.J.O. “Jody, Brad & Sarah did a great job of handling my divorce case. Although divorce is an unpleasant experience they made me feel confident in the way it was handled. I would recommend Stahancyk, Kent & Hook to work for you.” – M.C. “Brad Miller and team were wonderful during my recent divorce. During the most difficult time of my life, they were professional, ethical, and kind. During our first meeting, I asked for efficiency and fairness in regards to the divorce and that’s exactly what was provided. Brad and team were responsive and straightforward to all of my questions along the way.” – A.G.
“Brad Miller and Andy Newsom at the Stahancyk firm may have reputations as great litigators, but they are also great strategizers, who will find creative ways to save you money! It was hard to believe they were able to put my case together so fast and get it through so efficiently and effectively (less than a month). They were able to quickly and efficiently resolve my case and achieve a result 10x better than anything I would have gotten if I had gone to court.” — A.